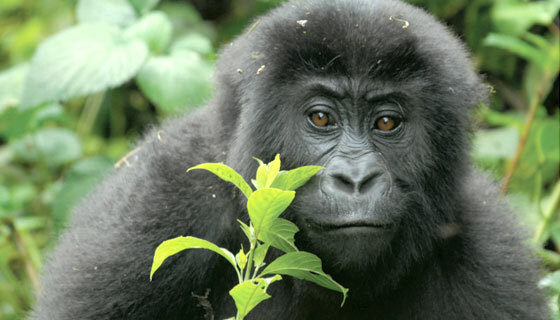 Did you know that Fauna & Flora International (FFI) help Eastern Lowland Gorillas? These wonderful animals are greatly endangered. All donations will be gratefully received, however large or small. Their population has plummeted from 17,000 to about 2,000. The exact number is unknown: problems in the DRC has meant that the gorilla population has been virtually unmonitored since 1996. But the area is now more stable, so the time is right to send teams in to previously unvisited areas of the National Parks to survey the remaining gorilla population. to know what steps need to be taken to protect them. This survey will also help raise the skill level of local rangers and give a considerable boost to their conservation knowledge. The findings of the survey will help FFI to put long term conservation plans into action. Surveys are crucial to help conservationists decide on the right way forward to save species such as the gorillas. The FFI has now launched an appeal to help raise £82,000 to fund this survey. How will donations be used to help FFI survey the Eastern Lowland Gorillas? Founded in 1903, it is the world's first international conservation organisation. Its mission is "to act to conserve threatened species and ecosystems worldwide, choosing solutions that are sustainable, based on sound science and take into account human needs". It works closely with local communities & conservation groups. In the case of the Eastern Lowland Gorilla, FFI works with the wildlife management authority of the Democratic Republic of Congo – the Institut Congolais pour la Conservation de la Nature, amongst others on the ground. They are working to improve the protection of Kahuzi-Biega National Park and better the livelihood of the communities living in the area.